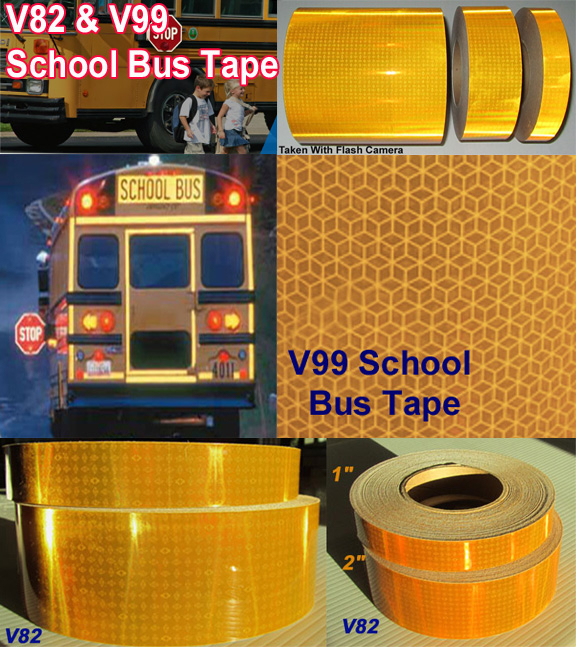 1", 2", 3", 4" and 6" x 150 feet rolls of V82 (brighter) prismatic grade schoolbus reflective tape.Designed for School Buses but can be used in a variety of other applications requiring maximum night time visibility. Manufactured by Orafol (formerly Reflexite). Comparable to Diamond or Crystal Grade Reflective Tapes in brightness. Cuts through rain, fog and snow. Visible from distances exceeding 1000 feet. Withstands high pressure washing and resists lifting. Due to its single layer patented design it continues to reflect even after impact. Very aggressive adhesive. Easy peel and stick installation. Our Reflexite V82 Tape is a type 5 (brighter) and has a 10 year outdoor rating. It is popular as an OEM tape. To apply simply clean vehicle surface with alcohol and water to remove any surface contamination. The peel the backing from the tape and apply. Press on with a soft cloth or squeegee. 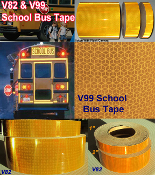 This tape is available in 50 yd rolls, in 1", 2", 3", 4" and 6" widths and in a V82 film. Make your Type and Width choice using the drop down menu above.